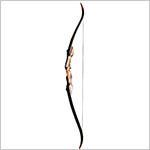 First you need to know that I have never built a recurve bow in my life, nor have I ever used any of the typical carpentry tools that are often associated with such a project. 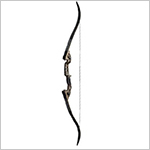 As a result, the following article will simply be a collection of various interesting online tutorials that I’ve found and which teach you how to build a recurve bow – takedown or otherwise. I’ll also include some of my own comments regarding each one. This might sound like a joke, but it’s actually been done. Quality skis are made of durable laminate as they are often required to withstand forces far superior to those which you exert on bow limbs during the shot. The downside here of course is that you have absolutely no control over how rigid your recurve is to draw – you’ll be fully at the mercy of the manufacturer. Here is a link to the guide: building a recurve from skis. If you decide to build this be very careful about using it in serious hunting conditions; unless the skis are of very high quality, you have no way of knowing how much bending they’ll be able to take before breaking. You won’t need any highly specialized equipment, although having a good table saw would make the building process much easier. There is an excellent four part tutorial on building a reinforced recurve bow over at GodLikeProductions. The videos are really well produced and in total last around 35 minutes. While the author of the videos does use some tools that the majority of us don’t have available to them, in most cases you’ll be able to find usable substitutes. For instance, rather than using an electric sander, you can always use sanding paper (albeit it will obviously require more work). Now we get into the more serious stuff. 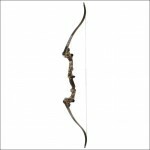 These recurve bow building plans are very detailed and give you far more control over what your recurve bow will turn out to look and shoot like. However, it also requires more tools and patience to build. You’ll need a lot of precision to build a bow using these instructions. Even a few thousands of an inch off in your calculations of limb thickness could result in a considerable difference in draw weight. As a result, you’ll need high-precision tools. This is a typical modern recurve bow construction, where the limbs are made of two outer layers of fiberglass, with a layer of wood in between them. There’s a lot of sawing, precision cutting, and gluing involved, so unless you are comfortable with these things, you should not attempt the project. These are my personal favorite instructables and definitely what I am going to use when I decide to build my first recurve bow. The process is simpler than in the previous plans, but this does come at the cost of a little less control over the shape of the bow – nothing too severe however. You can fin the instructables on this page. These plans include high quality step-by-step pictures with very detailed and easy-to-read instructions. You will still need a wood trimmer, sander, and a few other tools to follow the steps in this plan. However, larger tools such as a table saw would, as always, be very helpful. You’ll also need an air pump and a pressure hose, otherwise you won’t be able to apply enough pressure to the limb laminations. Of course you can mix and match if you’re experienced or creative; using a few steps from one of the plans above and combining them with different steps from a second plan will also work, just as long as you are fully aware of what you’re doing and have some carpentry experience under your belt. Hopefully you’ll find the information above a little useful and that one of the building guides will meet your requirements. I will be updating this article whenever I run into a new way of building a recurve bow, so if this is something that really interests you please do check back often!